A husband-and-wife team, Doctors Eric and Kristina Lewis are professionally trained naturopathic physicians and experts in natural health and holistic medicine. Integrated Together as a Comprehensive Plan Just for You! Our compassionate, joyful approach to health care creates results. We are a qualified resource for you on natural and alternative medicine. We are both honors graduates from a four-year professional naturopathic medical school, experts in both the science of medicine as well as the art of holistic healing. As a team of naturopathic physicians we assist patients locally in Asheville, North Carolina and consult nationally with patients in Tennessee, South Carolina, Virginia, Georgia and beyond. We help you feel better. We don’t just use naturopathic remedies and therapies because they are natural; we use them because they work. Getting results from safe and effective holistic medicine is what we do best. It costs much less to stay healthy than to get healthy once disease has set in. Preventative health care is our specialty. We see each patient as a unique individual, and we work with you the whole person. Your comfort, health and wellness are our top priority. 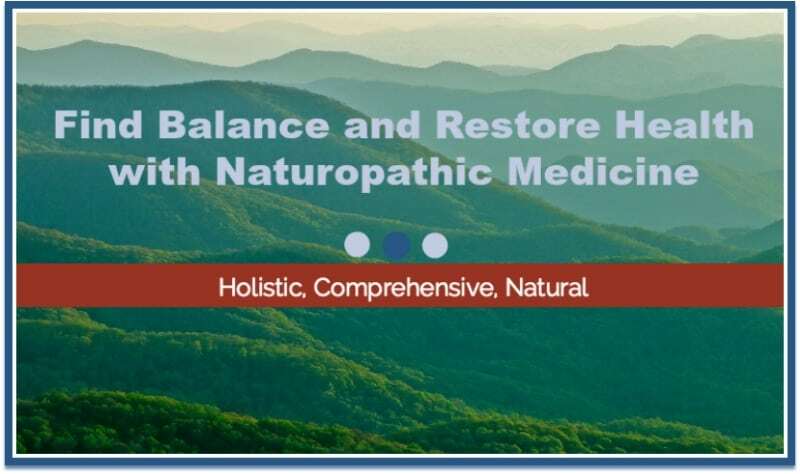 To learn more about your holistic healing, naturopathic medicine and alternative health options in the Asheville area and beyond, we invite you to explore our website. We recommend that all potential patients take advantage of our complimentary 15-minute initial consultations. These free 15-minute consultations can take place in the office or over the telephone. The New Patient Series is actually two appointments, spaced a week apart, that are designed to allow our doctors to get to know you and your health concerns at a deep, detailed level. This comprehensive naturopathic assessment is necessary so that an individualized plan can be created just for you. In preparation for your first appointment, please download and complete our New Patient Forms. These forms are designed to help us learn as much about you as we can before your first visit. They may take some time to fill out, so don’t wait until the last minute to start working on them. The American Association of Naturopathic Physicians (AANP) is the national professional society representing licensed naturopathic physicians. The NCANP is a dedicated group of highly trained physicians who specialize in Naturopathic Medicine in North Carolina.